Three MASSIVE singing opportunities in the same term. 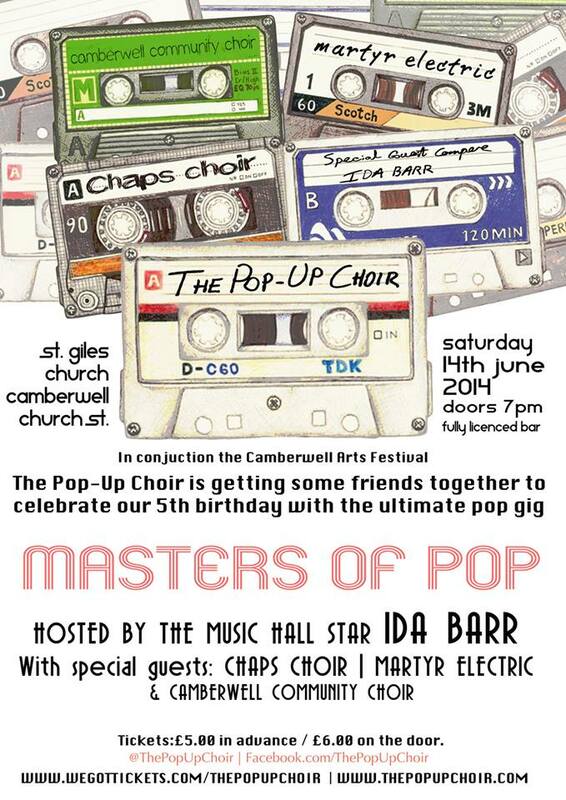 First up is the ‘Masters of Pop’ concert at St Giles’ on Saturday 14th of June. Everyone knows that it’s England’s first game in the Football World Cup – but since it’s starting at 11pm and this concert is at 8pm (doors open earlier) who cares?! What a great way to warm up the vocal chords for singing EN-GER-LAND, EN-GER-LAND later on raucously. Or not. Anyway, next up is our debut at The Young Vic! Our two performances will be on Tuesday 8th and Saturday 12th July – see the calendar for details. 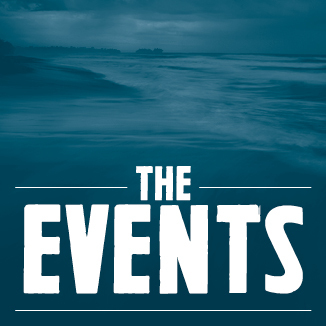 ‘The Events’ has got so much praise from critics and theatre goers alike – it’s going to so good to be involved! Finally, our term will finish on a somber note as we sing at a civic event commemorating the beginning of WW1 on Monday 4th August. We’re going to be leading the musical part of this service and we have the chance to make it a very special occasion for everyone there. Again, more details in the calendar section. So there you have it – an epic term is in store! As usual, please tell others about what we’re up to and encourage people to come to a rehearsal or three! What a way to end our spring term! Last night was the big concert at St Mark’s and we sang so well! Our four songs were probably the most varied we’ve sung together in one performance; from the four-part latin motet ‘Ave Verum’ by Mozart to the classic ‘rhythm of life’ and the World War One song ‘they’ll never believe me’ to the American folk song ‘Wayfarin’ stranger’ sung in a motown style, we had everyone singing along in their seats! It was a great sound joining in with the other choirs too in ‘lean on me’ and ‘amazing grace’. There’s something so moving when you hear so many voices alongside your own – such a good experience. All three choir leaders joined in the mass singalong and we forgot to get a photograph of everyone in action – thankfully though we do have a picture of the after party! Anyway, that’s all for this term! 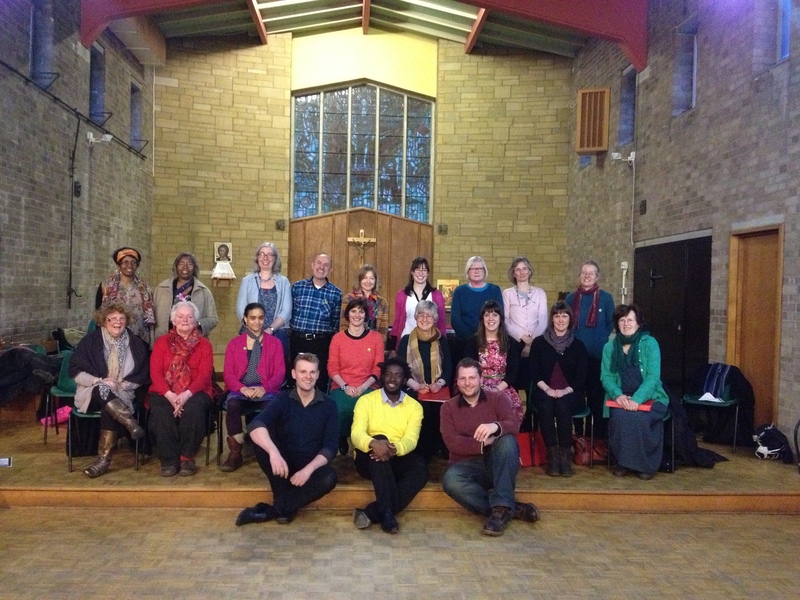 Choir starts again on Tuesday 29th of April in the St Giles’ Centre at 7.45pm. We’ve got lots to look forward to – rehearsing for a theatre project with the Young Vic and preparing for a World War One concert with King’s College Hospital. Thanks for all your efforts and support so far this year – have a very happy Easter. At choir last night, we were putting the finishing touches to our programme for our spring concert next Thursday. We have one choir rehearsal left! Usually we do our spring concert all by ourselves in a venue in Camberwell. 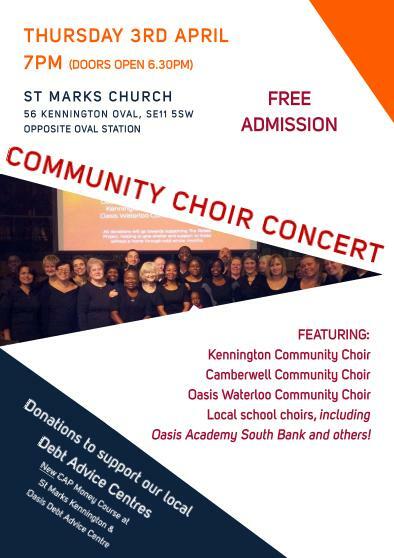 This year though, we’re travelling to St Mark’s Church next to Oval Tube station and joining in with two other community choirs – and a few school choirs for good measure! It’s fair to say that in the last ten years’ or so, there has been an explosion of singing both in schools and in communities. TV programmes, such as ‘The choir’, have contributed to the general attitude that singing is once again cool. 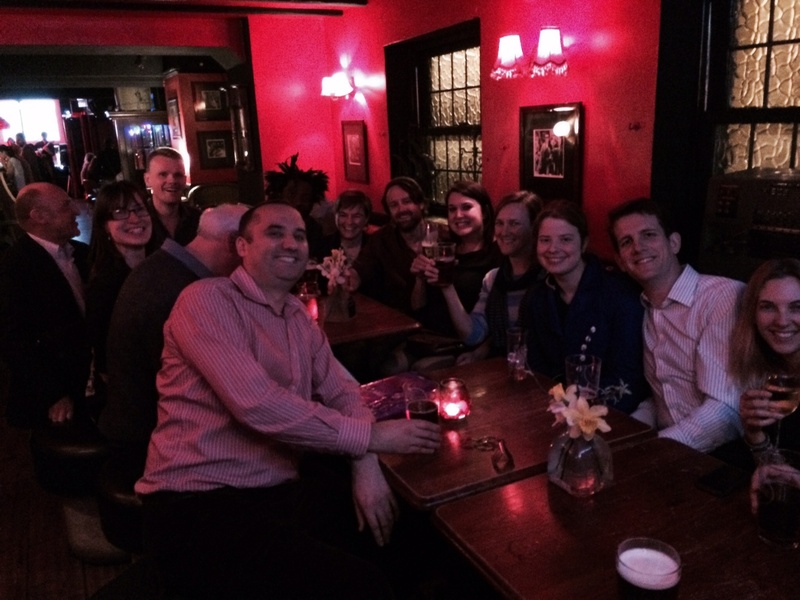 Research shows that there are physical and mental benefits to joining a choir. And perhaps most of all in today’s fantastically busy world, singing provides a unique way of escape. You could even go as far as saying it puts us back in touch with our roots – in an age of amazing technology. So without getting too sentimental about the times when singing was so much more commonplace in people’s everyday lives than it is today, it’s so good that we can join other choirs just like us and promote singing for what it is. A way to make music and improve your body and soul. Well at least with our choir, you can’t blame the leaders for not keeping you on your toes. And we’re all going to have to be for our next performance… Yes, we want to scare people with our singing – but in a good way! It’s our choir’s third Halloween performance and this year we’re really pushing the boat out! 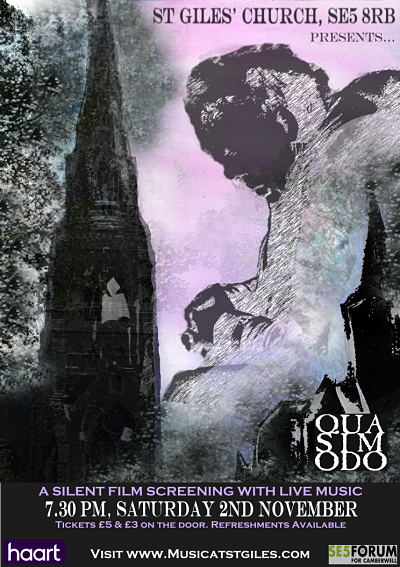 The plan is to sing along to a 1924 silent film featuring Victor Hugo’s tragic hero, Quasimodo. It’s going to be a lot of work, but in collaboration with lots of other musicians we think it’ll be worth it and hopefully lots of fun too. It’s going to be screened at St Giles’ Church at 7.30pm on the 2nd of November and we’re even hoping to ring some of the bells in true Notre Dame style. Our First gig of the Summer! 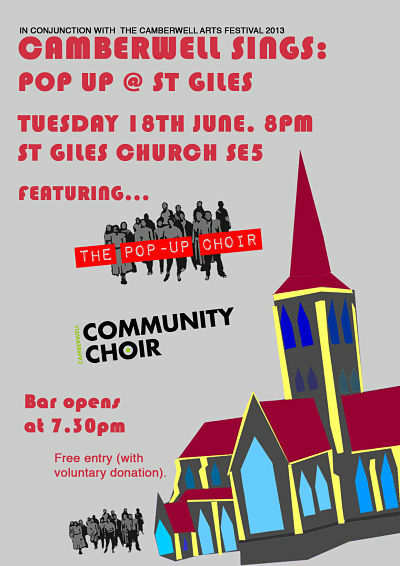 On Tuesday, we’re looking forward to our first collaborative choir gig! Doors open at 7.30pm and the concert starts at 8pm. There’ll be wine available and the concert is free – donations are gratefully accepted. Thank you to everyone who sang and helped with our 2013 Spring Concert! It couldn’t have been much colder outside… but inside St Matthew’s church, our music warmed everyone’s hearts! We probably had the most varied programme yet for our choir. Matt’s song from the ‘Marriage of Figaro’ was thrilling! Aga’s version of ‘Stand by me’ was the perfect way to start our concert. And Ashley’s choice of Mendelssohn’s ‘Spring Song’ with unusual words certainly put a smile on people’s faces! We’re going to have a break now until we resume rehearsals on Tuesday, 23rd of April at 7.45pm. Hopefully.. the weather will be warmer with the lighter evenings so it’s a perfect chance to ask people to come and visit our choir! A quick note to say that this Sunday, the choir will be performing a Spring Concert at St Matthew’s church, Lilford Road, SE5 9QG at 5.30pm. If you’re reading this post as a choir member and you need to know what to wear etc. click on the Calendar tab above!